Item # API, Heavy Duty Process Pump according to API 610, 10th ED. Series NCR On Dickow Pump Co. The DICKOW-pumps, type NCR, are heavy duty centrifugal pumps for petroleum, petrochemical and natural gas industries. The pumps are designed and manufactured according to API 610, 10th ed. / ISO 13709. This international standard specifies requirements for centrifugal pumps used in the above industries. The standard does not refer to any outline dimensions of the pumps. The performance range of the NCR-pumps is subdivided such that acceptable efficiencies can be achieved for all service conditions. The maximum capacity goes up to 700 m3/h (3100 USgpm). Differential head up to 145 mLC (480 ft) at 2900 rpm and 220 mLC (660 ft) at 3500 rpm. With a wide selection of materials and the possibility to install all shaft sealing systems according to API 682, DICKOW-NCR-pumps are suitable to convey nearly all kinds of liquids which are usual in the above mentioned industries. E.g. acids, lyes, chlorinated hydrocarbons, heat transfer media (HTM), all kinds of hydrocarbon fuels, liquid sulphur, melted plastics, bitumen etc. If the application requires sealless pumps, consider also our magnetic coupled PRM-pumps according to API 685. 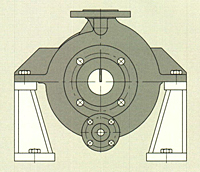 The NCR-pumps are centerline mounted single stage overhung pumps (designated pump type OH2). They have a heavy duty bearing bracket to accept all forces imposed upon the pump shaft and maintain rotor position during operation. The pumps are mounted on an API baseplate and direct coupled to the drivers. The pump is of back-pull-out design. That means rotating pump unit (including bearing bracket, intermediate casing, shaft sealing and impeller) can be removed without disassembly of the volute casing. Suction and discharge pipe remain connected. In connection with the standard spacer coupling, motor can remain bolted down to base plate. The single or double volute casings of standard design are cast en bloc and centerline mounted. The design pressure rating for the standard materials is 4000 kPa (40 bar or 600 psi) at38°C(100°F). Pump flanges are full or spot faced on the back and designed for through bolting. Drain connection is available at the bottom. No vent connection required because of the self- venting configuration. The radially split casings have metal-to-metal fits, with confined compression controlled gaskets to avoid blow outs. The pumps are designed for satisfactory performance if they are subject to the forces and moments in table 4 of the standard. Fully jacketed volute casings are available as an option. Pumps can be heated or cooled with water, steam or oil. Maximum allowable heating temperature 330°C (620°F), maximum pressure 24 bar (350 psig). Flanged connections for heating fluid are standard. Pumps with jacketed casings may be required if the melting or cristallization temperature of the pumped fluid is higher than the pump's ambient temperature. The standard pump impellers are closed, manufactured of single-piece castings with solid hubs. The impellers are keyed to the shaft and secured by a cap screw with Heli-Coil insert. The impeller thrust loads are hydraulically balanced by wear rings and balancing holes to the suction side. Special care was taken when designing the impeller eye to achieve low NPSH-values. The impellers are properly statically and dynamically balanced according to paragraph 5.9.4 of the API 610, respectively ISO 1940-1, grade G 2,5. Renewable wear rings are provided at volute casing, intermediate casing and impeller. The wear rings are held in place by screws. Running clearances meet the requirements of paragraph 5.7.4. (clearances are used to limit internal leakage and to balance axial thrust). 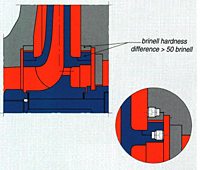 Mating surfaces of the hardened materials have a difference in Brinell hardness of at least 50 HB. For certain applications with very low NPSHA- requirement, inducers can be provided. Contrary to former inducer designs, this inducer offers NPSH-improvement from minimum flow to maximum flow. Retrofit of inducers on site is possible without change of suction pipe. The bearing housings are dimpled to facilitate hand held vibration transducers. Threaded connections for permanently mounted transducers or flat surfaces for magnetic based vibration measurement equipment are available on request. The pump shaft is sized to transmit the full driver output and is accurately machined thoughout his entire length and has a proper finish on bearing mating surfaces. All shaft keyways have fillet radii conforming to ASMI B17.1. 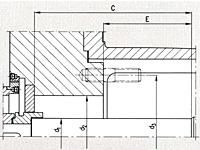 To obtain satisfactory seal performance, the shaft stiffness limits the total deflection. This limit is achieved by the combination of shaft diameter, shaft span or overhang and casing design. The shaft design guarantees that the first try bending critical speed is at least 20% above the pump's maximum continuous operating speed. The NCR-pumps will be equipped with mechanical seals and sealing systems in accordance with ISO 21049 (equivalent to API 682, category 2/3). The seal chamber dimensions conform with paragraph 5.8.3 (Figure 25, Table 6) of API 610. 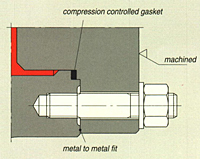 "Category 2" seals are standard, for temperatures from -40°C (-40°F) to +400°C (750°F) and pressures up to 42 bar (615 psig). "Category 3" seals are available on request. The following specified materials for the main pump parts are standard materials according to API 610, Annex H. Table H1, provided by DICKOW. Further materials are available on request.